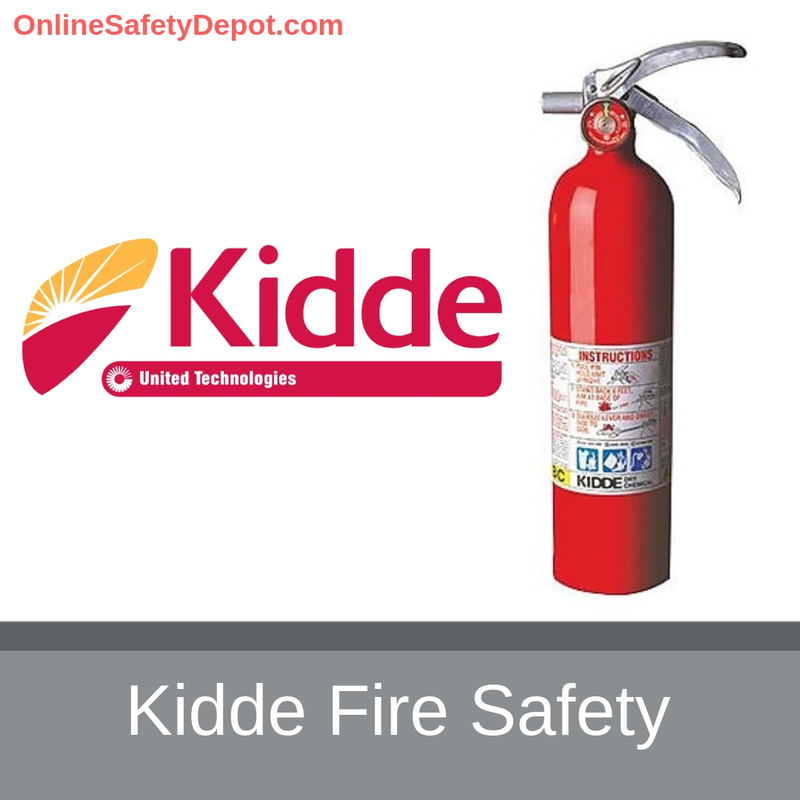 Kidde is a division under the United Technologies Corporation that manufactures and distributes fire detection and suppression equipment, as well as smoke and CO alarm units. Headquartered in Mebane, North Carolina, Kidde has a long history going back to when the company was founded in 1917 by Walter Kidde using $300, he had in savings. That company known as Kidde, Inc. began to grow with the purchase of ship fire detection systems and a patented siphon for quick release of carbon dioxide. With this technology produced Kidde produced the first portable carbon dioxide fire extinguisher and installed the first industrial fire extinguishing system. These firsts produced a growing confidence and presence of their innovation in the fire safety industry and in 1926 lead to the formation of a partnership between Kidde and the United States Navy to design a system to protect airplane engines against fires. Over the following decades the scope and reach of Kidde expanded worldwide and reached a peak with their production of equipment and materials to support the war effort. Following the war and with a drop in sales the company diversified into the development of machinery and tool manufacturing, medical equipment, and aircraft accessories. Continued advancement and diversities lead to a 2004 declaration by Financial Times that Kidde was “the market leader in residential fire protection in the US.” Today Kidde is recognized as a top fire safety company and a designer and manufacturer of fire safety equipment that continues to expand its product line through innovation to provide solutions to fire safety and protection. In addition, Kidde continues to lead out in educational materials (including laws and legislation) and training, making it available to their customers, the public, and fire safety professionals to make homes, businesses, and communities as safe as possible. Kidde also takes an active approach to giving back, donating more than 100,000 smoke and carbon monoxide alarms and fire extinguishers to fire departments and non-profit organizations across the country. Smoke Alarms: Kidde provides all types of smoke alarms for early detection and the fight against fire damage, live and structure. 10-Year Battery Powered Smoke Alarms: This 10-year sealed battery smoke alarm provides those whose homes rely on continuous battery-powered smoke detection with peace of mind knowing they are always on. Of note is that the National Fire Protection Association recommends replacing smoke alarms every 10 years. General Battery Powered Smoke Alarms: These easy installed alarms are inexpensive and designed to protect homes that are not pre-wired with an interconnected system. This means they continue to work during a power outage and include a test button and power indicator light for identification of working order. Hardwired AC Operated Smoke Alarms: 120V AC wire-in life safety products with interconnect capability so when any one interconnected alarm is triggered by smoke, all interconnected alarms within the home sound an immediate warning. Intelligent Wire-Free Smoke Alarms: This advanced wireless technology enables any home to have an interconnected system without expensive wiring. 3. Kitchen – The kitchen is the likeliest place you will have a fire. Protect your home with a 711A extinguisher in the kitchen area. Fire Extinguishers for Home or Office: Kidde offers the Pro Series, a full-featured line designed for home or office. All models come with a 6-year warranty. meet or exceed NFPA home and workplace requirements, and all models are rechargeable. Fire Extinguishers for Vehicles & Boats: The Mariner line of dry chemical models come with a corrosion resistant finish, retention brackets to meet United States Coast Guard (USCG) approval, with some rechargeable and others disposable. All vehicle line models come with retention brackets designed to meet Department of Transportation (DOT) approvals for securement during transit. Residential Fire Extinguishers: Designed for use in and around the home, all models are single use, meet NFPA primary recommendations and feature a 10-year warranty. Commercial Fire Extinguishers: Designed to protect your business, assets, and employees from dangers from fire, installed to meet the NFPA recommendations. Pro Line Series: Available in ABC and BC dry chemical and Carbon Dioxide. 5 lb., 10 lb., and 20 lb., ABC dry chemical models meet or exceed NFPA requirements from light and ordinary up to extra hazard occupancy requirements. Pro Plus Line Series: A full featured line of professional type fire extinguishers to meet industrial and commercial fire protection needs. All models meet or exceed national code requirements and come in ABC dry chemical and BC dry chemical. Carbon Dioxide Series: Industrial grade models designed for indoor applications in combatting liquid and electrical fire hazards, and without leaving a damaging residue for cleanup. Suitable for Class B and C fires. Halotron Series: These extinguishers contain a highly versatile and environmentally safe and effective clean agent specially designed for use in computer rooms, data storage, telecommunications, robotics or any high-tech industrial setting. Suitable for Class A, B, and C fires. Water & Wet Chemical Series: An excellent choice for use on combustible cooking media, meet Class K test requirements, and are an effective supplement to pre-engineered restaurant suppression systems. Class A fire suppression. Wheeled Fire Extinguisher Series: Available in multipurpose dry chemical and Purple K agents, for addressing high risk fire hazards in commercial and industrial settings. Safety Accessories: Accessories also play an important part in fire safety. Auxiliary Devices: Strobe light devices for the hearing impaired, heat alarms for when heat detection is preferred over smoke, and radon gas detection home kits. Escape Ladders: If your home has two or three stories, an escape ladder appropriately placed in every occupied bedroom can provide the escape option if a fire prevents the house escape route. Key Security: Key storage boxes, cabinets and mechanical keyboxes are available for both residential and commercial applications. Home Automation: These home monitoring systems are designed to be user-friendly while providing remote access to home emergencies when you are away. RemoteLync: Ideal for primary residence when away, for a vacation home or rental property, this system plugs into a single outlet and detests smoke or carbon monoxide alarms and notifies the owner on iOS and Android compatible phones and tablets. RemoteLync Camera: Sensitive to motion, if detected, the RemoteLync Camera sends and alert via email or push notification to your mobile device, or any people you set up to be in your network. If an alert is triggered, the camera will also sound an alarm and immediately start recording video, allowing you to dismiss the alert or take action.